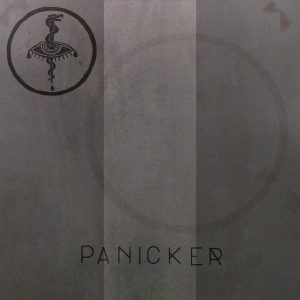 PANICKER’s self-titled debut LP seeks to give a voice (sans vocalist) to the anxious emotional state occupied by musician/producer/sound engineer Brent Asbury– as well as, it seems, society as a whole. The feeling is frightening, all-consuming and urgent, and he captures this well. Having worked with artists across the gambit from The Locust to Pinback to Michael Bolton, it might be hard to imagine what his own dissonant brainchild would sound like. The answer is, surely, none of the above– or at least, unlike any one individual category or predecessor. Tracks such as “Habits” tap into the horror vibe heavily, building tension and yet shifting into upbeat slides and bright accents with fluidity. “Airport” strikes like an alarm signalling for emergency evacuation, yet works in a techno-dance beat that seems welcoming of a jam-packed, sweat-stained party. Asbury reluctantly describes Panicker as “an attempt to make pretty normal music–blending aspects of EBM, industrial, techno and hip hop with the intensity and heart of punk, metal, and horror films,” which is apt if not still slightly nebulous. But, where genres may be negligent, the title, “PANICKER,” serves well.